Farm tractor-The HP Series tractor(eg,35HP farm tractor)load more horsepower has a wide range of ideal applications. Hydraulic capacity increases, new tire choices, increase horsepower, FT4 engine, and a quiet cab and the cab is a more equipped you will enjoy the new features of the application of new sampling. Facing the International Challenge,many Chinese tractor companies will target the international market, an increase of "the world" strategy execution. 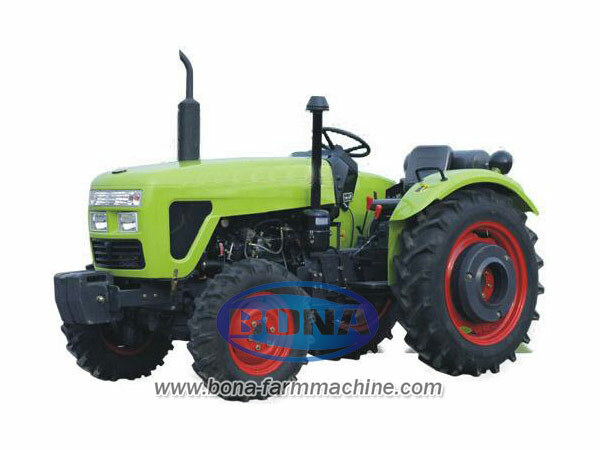 In recent years, the characteristics of tractor China in export trade following . Farm tractors made in China-Exports to grow steadily. Export target countries and regions, numerous and scattered. 2007 export countries and regions in the first half of 140, including some developed countries such as the United States and Britain, and some developing countries, such as Southeast Asia and Africa. Changing hotspot, new markets continue to emerge. United States and India is a major importer of China wheel tractors in recent years, exports to Africa, Eastern Europe and surrounding counties showed an increase trend. Russia, Ukraine, Egypt, Pakistan, Iran, Brazil, Britain, Angola and Thailand have become the major export markets of tractor China. According to export tractors, we can see that one of the main structure, but according to the highest growth rate and high power tractors, medium and small power than the small four-wheel tractor. Of course, the high growth rate is very good, but we know that the tractor industry in some factors China that will limit their exports continued to grow.